A lack of good judgment or care in behavior and especially in speech: As a reporter for the city newspaper, Eve has been criticized for showing indiscretion regarding her written remarks about the mayor. 1. A ceremony or formal act by which a person is inducted, as into office or military service; such as, the registration and induction of military draftees. 2. With electricity, the generation of electromotive force in a closed circuit by a varying magnetic flux through the circuit. 3. In logic, the process of deriving general principles from particular facts or instances; a conclusion reached by this process. 4. The act or process of inducing or making something happen; such as, in medicine, the inducing of birth labor, whereby labor is initiated artificially with drugs such as oxytocin. 5. Presentation of material; such as, facts or evidence in support of an argument or proposition. 6. In electricity, the generation of voltages, currents, electric fields, or magnetic fields by interactions among these quantities without direct contact. Lacking in erudition; unlearned condition. The advocacy, or policy, of deliberately causing economic increases in the supply of available currency and credit: "Inflationism is policy or belief that encourages an increase in the level of consumer prices or a decline in the purchasing power of money which is caused by more available money and credit beyond the amount of available goods and services." 1. The act of breaking or violating a law, a pledge, a contract, or an agreement: Monroe was penalized for an infraction of parking on the street beyond the time limit. 2. 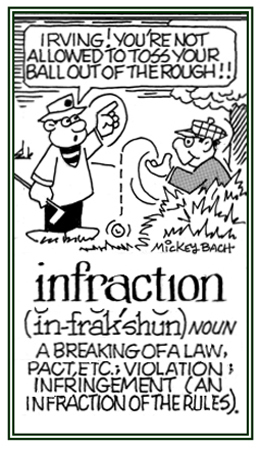 Etymology: Middle English, from Medieval Latin infraction, infractio; from Latin, "subduing", from infringere "to break". © ALL rights are reserved. 1. A feeling of being embarrassed or a belief that prevents a person from behaving spontaneously or speaking freely: Marie is a very outgoing person and so she doesn’t have any inhibitions of talking to people she meets for the first time. 2. 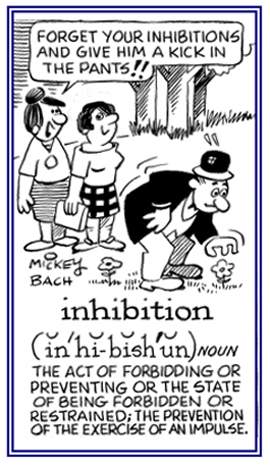 A mental state in which a person's activity or behavior is stifled or obstructed: Shy people are often said to suffer from inhibitions. 3. The slowing down or prevention of a chemical reaction: Certain substance inhibitions are widely used to retard various undesirable processes; for example, the corrosion of metals. 4. The suppression or blocking of a bodily process or the action of an body organ: The doctor caused the inhibition of Jim's heart beat with an electrical stimulation of the vagus nerve. 5. Etymology: from Latin inhibitus; from inhibere, "to hold in, to hold back, to restrain"; from in-, "in, on" harbere, "to have, to hold". © ALL rights are reserved. 1. A succession of detailed and relentless questions: Louis, the ring leader of the playground gang, said he felt like he had been through an inquisition after he had been to the principal's office. 2. An investigation that is harsh or even unfair: When capitalized, "The Inquisition" was an organization in the Roman Catholic Church founded in the 13th century to find, question, and sentence those who did not hold orthodox religious beliefs. The Spanish Inquisition lasted until the 19th century and was known for its harsh punishments and use of torture. Showing page 14 out of 21 pages of 308 main-word entries or main-word-entry groups.